Whenever I ask someone to fill out a pedigree or family group sheet they would normally write a woman's name with her married and not maiden family name. In most instances I find this quite annoying as I would not know what the wife's maiden name was and this for me is a big loss of personal identity. I suppose it isn't the fault of modern-day Filipinos. Although we were under Spain for more than three centuries the education our ancestors received were rudimentary and backward. When the Americans came to colonize the Philippines they used education as their tool of colonization just as the Spaniards used religion. The American way of recording names was always, example, Mr. & Mrs. Smith; this meant records would indicate most often than not that the wife of a Mr. John Smith was a Mrs. John Smith. In census records a household was always listed under the male last name and again we would not know what the last name of the mother was. That is why I simply adore the Spanish method of record keeping. Before the government stepped in and recorded births, marriages, and deaths, the church kept careful vital records to keep track of the events of their parishioners' life. 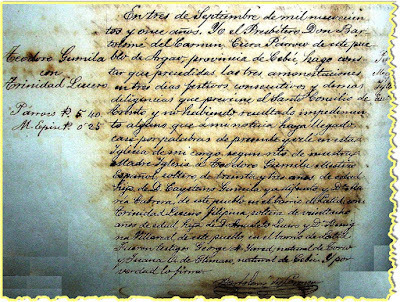 The beauty about Spanish-era Philippine records is that you'd get a lot of information when tracing your family tree. 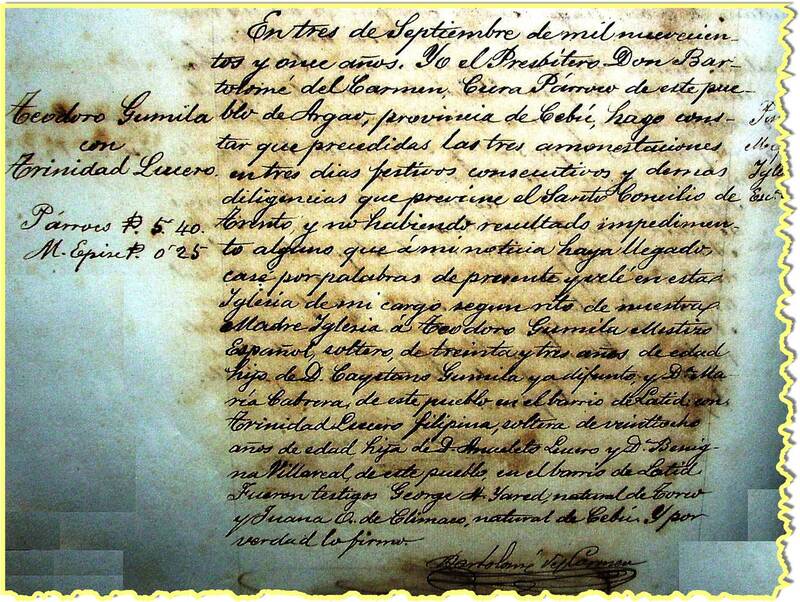 Baptismal records, called libros de bautismo, usually mentioned the date of baptism, followed by the date of birth (and in many cases the time of birth, as well), and the name of the child. In most cases the order of birth was also indicated, making sure the older siblings are accounted for. Then the name of the parents, then the godparents. A sample baptismal record from 1869. Matrimonial records, or libros de matrimonio, mentioned the names of the couple, the date of marriage, the parents of the couple, and wedding witnesses. Sample marriage record from 1911. Burial records, or libros de entierros, listed the name of the deceased, the date of burial, the spouse of the deceased if married or the parents if single, and the two types of causes of death, either muerte natural or natural death or muerte violenta or a non-natural death. A sample burial record from 1871. These records alone were a minefield of information. Then, sometime in 1868, the records expanded. Baptismal records now included the occupation, place of origin, and residence of the parents, the name, occupation, place of origin, and residence of the grandparents (and whether or not they were still living). Death records now specified if the deceased was young or old and when available, the actual cause of death; it also included the names of parents and grandparents even if one was married. This record keeping style was continued, at least for the part of baptismal records, until the 2nd world war in most parishes. For death records, however, the mention of grandparents only lasted until about 1878, then it went back to the former style. This is the reason why, in my own opinion, it is very easy to trace one's Filipino roots as long as the church records of one's hometown were not destroyed at any point of Philippine history. I myself have been able to trace more than 8 generations of almost all of my ancestral lines save for my roots in Cebu City and in Leyte. The beauty of Spanish records is that the women were always listed under their maiden name, so there was no confusion or lack of information as to the maternal family. If only the Americans continued this type of record keeping, modern research on Filipino genealogy would have been ever easier than it already is. Luckily this isn't a Spanish thing, but with many other cultures where the names were straight. If anything, it's probably American society that pushes the male names more than anything, although this exists for other countries but as far as genealogy is concerned, I've seen female family names kept in records, although I'm trying to remember if I saw them at all like that for American records.